Hawks base started their topic with a bang, after discovering an alien landing on the school field. 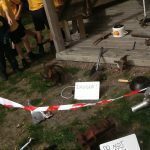 The children were called out onto the field to find an array of strange metallic objects strewn around the gazebo and cordoned off with police tape! 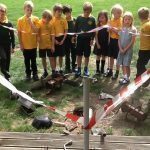 They had just started to read The Iron Man by Ted Hughes, and the crash site sparked their imaginations with lots of ideas for writing and some fantastic conspiracy theories! Many thanks to North Somerset Metal Recycling in Tweed Road for their support with this project.